I truly believe God puts people in our lives for specific reasons, and I'm so lucky that he put Iliasis in mine :) As I described in some of my recent blog posts, Iliasis, from Iliasis Muniz Photography, was one of the first people who reached out to me after my husband and I made the big move to South Texas. I can't even begin to tell you how happy I was to connect with a fellow young entrepreneur in our new home of South Padre! After our initial brunch together we started collaborating on a beautiful beach photo shoot. The idea of getting married on the beach is romantic on its own, and we made it a point to make the shoot look like something out of an island fairy tale. We selected the color pallet of the shoot to complement the natural hues and beauty of the island. The neutral white and cream pallet we chose allowed the ocean blues and sunset pinks, reds and oranges to speak for themselves. Clear chivari chairs, a chandelier adorned gazebo and satin chair backs added a subtle touch when paired with the bride's attire. What really tied this whole shoot together was THE DRESS! We rented our fit and flare Jenny Packham gown from the wonderful team over at Borrowing Magnolia. For those unfamiliar with this fantastic company, Borrowing Magnolia is basically the Rent the Runway of wedding gowns. While designing this shoot, we kept the destination bride in mind. The beach bride is likely to be an ocean loving, laid back lady who understands that the beauty of nature is as good as even the most extravagant indoor set-up. Borrowing Magnolia is particularly suited for the beach bride, as it is a flexible and cost-effective option for those who want a high-powered designer gown. The rental process is simple, easy and it is still a thrill to find the right dress! For our flowers, Iliasis and I teamed with the talented floral designer Melly at Zoe Flowers and Designs. Her team is the kindest group of individuals to work with. I would seriously work with them 1000 times over. For our Meet Me By The Sea shoot, we asked that all blooms be white, then we gave her the creative freedom to be inspired by our theme and create formal pieces of her choosing. On the day of our shoot, the bouquet just took my breath away! 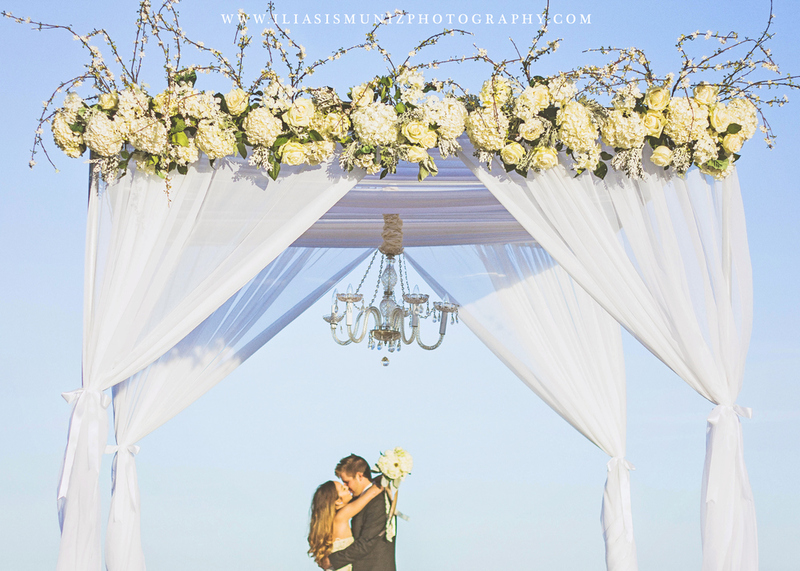 In addition to providing the bouquet, her team also adorned the ceremony gazebo and contributed all of the rentals. We could not have done the shoot without her. Thank you Melly! Can we take a minute to soak in that AMAZING sunset lighting that Iliasis captured. WOW! So pretyyyy! We lucked out with the models! They are actually recently engaged! Congrats guys! Fun fact: He proposed on a scuba diving trip! Andi is also a very talented, young entrepreneur. If you are getting married on the island, give Beautybyandi a call for all your hair and makeup needs! I can't tell you how lucky we got on the weather that day. It. was. perfect. So perfect that we were able to fit in a second photoshoot! Check out our bright colored, Valentine's Day inspired engagement shoot!